The Department of Veterans Affairs and the Veterans Benefits Administration offer a wide-range of programs providing financial, medical and other assistance to veterans. From pension programs to home loans, Veterans and their families are eligible for many benefits they may not know about. Take advantage of all the compensation and financial assistance available to you as a veteran. This guide will help you understand what you might be missing out on! VA mortgages have been around since 1944. The program is part of the Servicemen’s Readjustment Act, and is administered by the US Department of Veterans Affairs (VA). The VA does not actually fund mortgages – it’s a guaranty program. That means the agency reimburses mortgage lenders if borrowers default on VA home loans. Because this guaranty limits the lenders’ risk, VA loans are widely available and affordable. Buying a condominium unit in a VA-approved development, or a co-op unit. Repairing or improving your primary residence. Adding energy-efficient improvements to your home when you buy or refinance. VA mortgages are especially appropriate for eligible veterans (and in some cases their surviving family members) who need to finance more than 80 percent of their property value. That’s because they don’t require mortgage insurance. This guide covers the pros and cons of VA home loans, and what you need to know before applying for one. 2. VA Mortgage Now: Quick Start! If you already know that you want a VA home loan, this step-by-step approach will help you get one. 3. Is A VA Mortgage Best For You? VA loans are the best mortgages for many homebuyers, but no product works for everyone. These questions should help determine if a VA home loan is the right product for you. Do you plan to purchase or refinance a moderately-priced property? The VA home loan program was not designed to help rich people finance mansions. While there is no official maximum loan amount, there is a limit to what the federal government will guaranty. Most (but not all) lenders use the same formula: for loans over $144,000, the maximum loan amount is four times the amount of the VA’s guaranty. Can you document your income? VA mortgages are fully-documented mortgages, which means you must provide proof of income, such as W-2s, tax returns and pay stubs to your lender. Are you buying or refinancing your primary residence? VA mortgage loans can’t be used to finance rental property or vacation homes. You are allowed to rent out the extra units of a duplex, triplex, or four-plex if you live in one unit. You must certify that you will occupy the property as your primary residence and move in within 60 days of closing. Your spouse is allowed to satisfy the occupancy requirement if you’re on active duty. If not married and on active duty, you must occupy the home within 12 months. Sporadic occupancy by single veterans is typically not acceptable, and friends or relatives cannot occupy the property on your behalf. Are you putting less than 20 percent down or refinancing with less than 20 percent equity? Conventional (non-government) mortgages exceeding 80 percent of the property value require private mortgage insurance (MI). You pay for the VA mortgage guaranty upfront with a funding fee, which you can pay out of pocket or add to your loan amount. The funding fee may be waived for disabled vets. Do you want to do a cash-out refinance? VA allows cash-out refinancing up to 100 percent of your home’s value. Most conventional programs, and FHA home loans max out cash-out refinancing at 85 percent. In addition, the conventional surcharges for cash-out refinancing can run to several points, depending on your loan-to-value and FICO score. A VA mortgage may cost less. Note: all non-VA-to-VA refinancing is considered “cash-out,” even if you just pay off an existing mortgage. If you own your home free and clear, you can’t refinance with a VA mortgage. Do you expect mortgage rates to increase? VA mortgages are assumable. When you sell your home, the buyer might be able to take over your loan. (You’ll need to get approval from the VA or your lender first.) The buyer does not have to be VA-eligible. If your rate is lower than market interest rates, this feature can help you sell faster, or for more money. Do you need flexible underwriting? VA underwriting guidelines make qualifying for financing easier. For instance, if you filed for a Chapter 7 bankruptcy, you’ll need to wait four years in most cases to qualify for a conventional Fannie Mae or Freddie Mac loan (two years if you can prove there were extenuating circumstances). But you’d be eligible for VA financing in only two years, and as little as 12 months if you could prove that the bankruptcy was not your fault. In addition, VA mortgage guidelines impose no minimum credit score requirements. If the VA loan is right for you, your lender can help you get your Certificate of Eligibility right away. You may be surprised at some of the advantages offered by VA mortgages. It’s possible to find very large VA loans, especially for multi-unit properties. However, many lenders do limit loans to four times the VA guaranty. And, unlike conforming loans, there are no extra charges for cash-out refinancing. VA offers the Streamline VA-to-VA Interest Rate Reduction Refinance Loan (IRRRL). These refis require no credit qualifying, appraisals or income verification. VA loans require no minimum credit score. Underwriting guidelines are much less restrictive than those of conforming (Fannie Mae and Freddie Mac) programs. VA mortgages are fully assumable. They can be taken over by any qualified buyer (who does not have to be a veteran). The VA or your lender must approve assumption in advance. There is NO monthly mortgage insurance premium. The funding fee is your insurance premium, and you can wrap that into your mortgage, reducing your out-of-pocket costs. Many programs, including hybrid ARMs fixed for three, five, seven and ten years are widely available. Fannie Mae and Freddie Mac only allow three percent seller concessions for high-LTV loans. These contributions can go toward closing costs and discount points, but not your down payment, if you choose to make one. You can include Energy efficient improvements when refinancing or buying your home. The extra money is simply added to your loan amount without additional underwriting. While VA home loans are a great benefit, they’re not for everyone. In some cases, a conventional (non-government) loan is a better choice. While the VA imposes no loan limits, most lenders do. And lenders can choose to add minimum credit scores to their own guidelines. These additional requirements are called “overlays” By law, VA lenders cannot have guidelines that are less strict than those set out by the Department of Veterans Affairs – but they can be stricter. If you need maximum flexibility, you may have to look a little harder to find the right lender. Your funding fee increases with subsequent use. You can re-use your VA home loan benefit as many times as you like. However, it becomes more expensive. In 2017, if you’re a veteran buying a home with zero down, using your benefit for the first time, your funding fee is 2.15 percent. If it’s your second time using a VA mortgage, your funding fee is 3.3 percent. If you want to buy in a seller’s market, you may have trouble getting your offer approved if you require VA financing. In addition, most sellers require a substantial earnest money deposit, which you may not be prepared to do if you plan to obtain 100 percent VA financing. Sellers and real estate agents may believe that VA mortgages take longer to close, and are more complicated than conventional loans. That’s not usually true. VA mortgages are unwritten mostly by automated underwriting systems (AUS), and close just like other loans. Your agent may have to educate sellers about this when you make your offer. 6. Conventional, VA Or FHA? When buying or refinancing a home, you’ll probably want to run the numbers for VA, FHA and conventional mortgages to see which loan is the better deal for you. Studies show that about 25 percent of veterans do not use VA financing when they buy their homes, for a variety of reasons. Here’s a quick rundown of the differences between FHA, VA and conventional home loans. Upfront fees: 5% to 3.3% funding fee, depending on the size of your down payment and how many times you have used your eligibility. This fee can be wrapped into your loan. Comments: Only service members, veterans and some dependents are eligible. VA mortgages can be assumed by anyone who meets underwriting guidelines. Upfront fees: Same as for purchase unless refinancing a VA loan. Then the IRRRL (streamline refinance) fee is only .5%. Mortgage insurance: 0%, because it’s covered by the funding fee. Cash out: To 100% loan-to-value. Minimum down payment: 5% for applicants with credit score of 580 or higher, 10% for those with scores of 500-579. Minimum credit score: Officially, 500 for a 90% loan and 580 for a 96.5% loan. Lenders often set higher minimums. Upfront fees: 75% upfront mortgage insurance premium (MIP), which can be wrapped into the loan. Mortgage insurance: .85 percent annual premiums for most buyers but range is from .45 to 1.05 percent. Depends on loan amount at LTV. Comments: FHA is not restricted to first-timers or low income buyers. Upfront fees: 75%, which can be wrapped into the loan..
Cash out: 85% loan-to-value is allowed. No additional fees apply. Comments: Offered by Fannie Mae and Freddie Mac to borrowers who meet specific income criteria or buy properties in low-income census tracts. Homeownership education requirement. Upfront fees: 5% for FICO < 680. Minimum credit score: 680+ for LTV > 75%, 620 for LTV < 75%. Upfront fees: zero to 3.75% pricing adjustment depending on credit score and down payment. Comments: Underwriting is strict and risk-based pricing adjustments can be expensive if you have a small down payment or low credit score. Cash out: Allowed to 80%. Comments: Underwriting is strict for larger loans. These are not standard and must meet requirements of investor or lender. Usually, eligible borrowers are on active duty with the regular military, Guard or Reserves, or have been honorably discharged from a branch of the military. In most cases, the VA has your records on file. It and can provide your Certificate of Eligibility (COE) to your lender almost instantly through it WebLGY system. Alternatively, you can click here to get your certificate from the VA. You’ll need your DD-214 form proving that you’ve been honorably discharged. There are other instances in which you may be eligible – the rules depend on when you served. Click here for additional information. You can use your VA eligibility more than once. Normally, to re-use it, you sell your home, pay off your existing mortgage restore your eligibility. You can’t, however, have more than one VA loan at a time. If you pay off your VA mortgage without selling the property, you can restore your eligibility and get another VA mortgage. However, you only get to do this ONE time. To restore your eligibility, complete VA Form 26-1880, and send it to the Atlanta Eligibility Center. Document that the prior loan was repaid in full, with a paid-in-full statement from your lender or a copy of the CD (closing disclosure) for sale of the property or refinance of the prior loan. What if someone assumes your VA mortgage? If you sell your home with a VA assumption, your eligibility can be restored only if the buyer is also an eligible veteran who is willing to substitute his or her eligibility for yours. Otherwise, your eligibility won’t be restored until your buyer pays off your VA loan. If you used only part of your eligibility, and it cannot yet be restored, you can still use any leftover eligibility. You need to check with a lender to see if what’s left is enough for the loan you want, and if you need a down payment. If property is awarded to your former spouse, your entitlement cannot be restored unless he or she refinances the property and/or repays the VA loan in full. Or your ex is a veteran who substitutes his or her entitlement. Most people know about VA mortgages for eligible servicemembers, veterans and their families, but few have heard of the VA’s other housing-related assistance programs. Here’s what they are, and how they work. Adaptive housing grants for veterans with service-related disabilities help cover the costs of building or making homes more livable. This helps the homeowner live as independently as possible. There are three programs: Specially Adapted Housing, Special Housing Adaptation, and Temporary Residence Adaptation. The VA also provides emergency help to homeless veterans. Those who are homeless or in imminent danger of becoming homeless can contact their local VA Medical Center, call 877-4AID-VET (877-424-3838); or visit va.gov/homeless. The VA works with local agencies to supply benefits like subsidized rents and housing vouchers. If you are a veteran in danger of foreclosure, the agency can help even if you don’t have a VA mortgage. VA loan centers have counselors who can help you with solutions to your financial difficulties and work with your loan servicer. Finally, there is other assistance for eligible active-duty personnel and veterans that is not part of the VA itself. For example, the Military Housing Assistance Fund may help with mortgage closing costs, and many states offer full or partial exemption from property taxes for disabled vets. The federal government offers grants to eligible disabled veterans to help them buy, build or adapt homes to accommodate their disabilities. The Specially Adapted Housing (SAH) Special Housing Adaptation (SHA), and Temporary Residence Assistance (TRA) are all grants created for disabled veterans to help them lead more independent lives. In addition, organizations like Building Homes for Heroes build or buy homes and give them to eligible veterans and families. For more information consult the VA’s adaptive housing page. Many programs available to moderate or low-income homebuyers, first-time homebuyers and buyers in redevelopment areas are also open to qualified able-bodied vets. These include Mortgage Credit Certificates (MCCs), which refund part of the mortgage insurance paid by qualified homebuyers, down payment assistance (DPA) programs, and help with closing costs from the Military Housing Assistance Fund. There are various state programs that help veterans with housing-related costs. The Texas Veteran’s Land Board, for instance, provides low-interest property, residential and home improvement loans requiring low-to-no down payment. The home loan program also offers an interest rate subsidy to eligible veterans with a disability. And the Pen-Fed foundation supplies grants to veterans who are also first-time homebuyers. One of the best resources for special housing programs is the US Department of Housing and Urban development (HUD). Its State Pages contain links to housing agencies and charitable programs, including those created for veterans and military families. If you’re not a homeowner or ready to be one, there may be other housing support available. The VA, other government agencies, and charitable organizations offer a wide range of programs for disabled and able-bodied veterans who need help. The U.S. Department of Housing and Urban Development and VA Supportive Housing Program (HUD-VASH) offers rent subsidies. It pays subsidies directly to landlords, and the veteran covers the remaining rent due. The HUD-VASH program also supplies supportive services to women veterans, veterans recently returned from combat zones and veterans with disabilities. It locates veterans who need help via community outreach. It connects homeless and at-risk veterans with housing programs, health care, job placement and other services. It works with federal, state and local agencies, housing providers, employers and charitable nonprofits, increasing employment and affordable housing opportunities for veterans, helping them become self-supporting. If you’re a homeless or at-risk veteran, or trying to help someone who is, contact the VA. Visit or call your local VA Medical Center, which is staffed with trained coordinators to help you. You can also call 1-877-4AID-VET (1-877-424-3838) and get matched up with service providers who can help. The service is free and confidential. You can call for yourself or for someone else, and the lines are staffed 24 hours a day, seven days a week. If you’re homeless, you’ll be connected to the nearest facility for help. If you’re a friend or family member, you’ll be provided with information about available homeless and mental health programs for your veteran. Detailed below are some of the larger national providers of veterans’ service, how to contact them, and what they provide. Help for disabled vets takes several forms. Adaptive housing grants allow them to buy, build or modify a home to accommodate a service-related disability. VA funding fees are waived for disabled veterans who apply for VA-backed mortgages. And rental assistance helps those who do not own or wish to own their homes. The Veterans Service Center (VSC) determines eligibility for SAH and the SHA grants. To apply for a grant, first contact your nearest VSC. The physicians there examine you and your medical and service records and make a decision. For more information, visit the VA’s Adaptive Housing resource. Other organizations like the Disabled Veterans National Foundation offer grants to help disabled veterans cover rent or mortgage payments. It’s not a permanent subsidy but is intended to provide emergency help and prevent the veterans from becoming trapped in the cycle of payday loans, or being evicted. In addition, the HUD-VASH program provides housing choice vouchers, which allow recipients to rent any housing that meets the requirements of the program – not just those located in subsidized housing projects. The VA offers two kinds of grants for eligible disabled veterans — the Specially Adapted Housing (SAH) grant and the Special Housing Adaptation (SHA) grant. They are quite similar – the chief difference is that the SHA grant can be used for a home in which the veteran lives but does not own. The maximum SAH grant is $70,465. You can apply online at the Veteran’s portal at www.ebenefits.va.gov or by completing VA Form 26-4555 and submitting it to your local VA Regional Loan Center. SAH/SHA eligible veterans and servicemembers who temporarily live (or plan to live) in a home owned by a family member may get temporary grants. The maximum grant for an SAH-eligible applicant is $30,934 and for the SHA grant is $5,523. To apply for any of these programs, complete VA Form 26-4555, Veterans Application in Acquiring Specially Adapted Housing or Special Home Adaptation Grant. Submit the form to your local VA Regional Loan Center. Or you can apply online at www.ebenefits.va.gov. Veterans who need help caring for themselves may be offered in-home care through the VA as part of their medical benefits. Check out http://www.va.gov/geriatrics for more information. The Home-based Primary Care (HBPC) program provides in-home visits by a primary care doctor, nurse practitioner or physician’s assistant, care supervision by a nurse practitioner, physician’s assistant, or nurse, coordination of services by a social worker, physical, occupational, or speech therapy, mental health services, nutrition counseling, and medication management. Home health care is part of the standard VA medical package. All enrolled veterans can get HBPC if it’s medically necessary and available where they live. There may be a copayment for Home Based Primary Care. (The amount depends on your VA service-connected disability status and financial resources). To find out what your co-payments would be, you can contact your local VA medical center. Social workers there can walk you through the Application for Extended Care Benefits (VA Form 10-10EC). Not everyone has to complete this form. If you meet the criteria below, you are automatically eligible and make no co-payment. A veteran compensable with a service-connected disability. A veteran whose annual income is less than the Single Veteran Pension Rate in effect under 38 U.S.C. 1521(b). A veteran receiving care for a service-connected disability as determined by a VA health care provider and documented in the medical records. A veteran receiving extended care services that began on or before November 30, 1999. A veteran receiving extended care services related to Vietnam-era herbicide-exposure, radiation/exposure, Persian Gulf War and post-Persian Gulf War combat-exposure. A veteran receiving extended care services related to treatment for military sexual trauma as authorized under 38 U.S.C. 1720D. A veteran receiving extended care services related to certain care or services for cancer of the head or neck as authorized under 38 U.S.C. 1720E. A veteran receiving Hospice Care as a part of extended care services. While unapproved lenders can originate VA mortgages, only those with unsupervised automatic authority can approve your mortgage application on their own without consulting the VA.
Non-approved lenders add a layer of processing. Besides, only the most qualified lenders can get VA approval. Why wouldn’t you want to work with the experts? Are you licensed to do business in my state? Will you give me a written quote on a Loan Estimate? Ask for written quotes on Loan Estimate form, not just a worksheet or scenario. Worksheets do not obligate lenders the same way that Loan Estimates do. Do you apply overlays that impact me? Many VA lenders have standards that are stricter the VA’s minimum requirements. If you know your credit score is 620, don’t waste time with lenders that require 640 FICOs. Your VA mortgage experience depends on the skill, personality and work ethic of your loan officer or broker. The cost of your home loan is important, of course, but so is the excellence of your lender. Before committing to anyone, check out the guidelines below. Return your calls. Almost always within an hour. Know and can explain their programs. If they recommend a loan, they can tell you why it’s the best choice for you. And they do it in plain English. Offer more than one option. Often, more than one loan product will work for you. A professional explains the pros and cons of each and helps you make the best choice for your situation. Ask questions. They need information to determine the best program for you. How long do you plan to keep the house? Do you expect your income to rise or fall? Are college graduation, a new family or retirement in store? Does your income fluctuate? Are you a risk-taker or do you play it safe even if it costs more? If your lender doesn’t ask questions, find one who does. Work in your comfort zone. Do you want your loan documents early to review at home? Would you like your loan officer at your closing? Do you like detailed explanations, or just the bottom line? Your loan agent’s work style should reflect your preferences, not his or hers. Think and pivot when necessary. Your condo lost its VA approval. Your credit report came in with an unexpected blemish. The VA program you wanted was discontinued. These things happen, but a good loan agent foresees these possibilities and finds solutions. Because your home loan experience depends so much on the skill and character of your loan officer, you want a good one. Bad lenders, on the other hand, can cost you a lot of money if they don’t close your loan on time. So look for these red flags and avoid them. Are invisible. They’re playing golf when you call, and they don’t call you back. Recommend the same loan, every time. If you tell your broker that you have 20 percent down and plan to sell in five years, a 30-year fixed VA mortgage is probably wrong for you. Don’t care about your life. They push you to borrow more than you’d like. They don’t respect your right to financial privacy and spill to your real estate agent. They call when you prefer email. Are unhelpful. They hand you a stack of paperwork and a pen – good luck! They want the juicy details of your messy divorce or a letter from your CPA about your lingerie parties without saying why. Don’t know enough. Agents who don’t understand the special rules of VA lending can’t do the best job for you, even if they are super nice people. While many learn from their mistakes and eventually become VA experts, do you want to be the mistake they learn from? On its Web site, the VA warns consumers that just because VA mortgages are government-backed doesn’t mean the government sets their interest rates or costs. Private VA lenders like banks, credit unions, and mortgage companies sell, process, underwrite and fund their loans independently. Studies show that mortgage rates can vary between lenders by .25 percent to .50 percent on any day. And research shows that consumers can save thousands of dollars in loan fees by simply obtaining two to four mortgage quotes when they shop for home loans. This mortgage features a rate and payment (principal and interest) that does not change over its life. Fixed-rate VA mortgages can come with 10, 15, 20, 25 and 30-year terms. Typically, the shorter the term of the mortgage, the lower the interest rate, but the higher the payment. ARM loans feature lower rates than comparable fixed mortgages. However, their interest rates reset at regular intervals during the life of the loan. A one year ARM allows annual adjustments of no more than one percent and has a lifetime cap of five percent. This is much safer than conventional ARMs, which can increase as much as two percent per year six percent over the loan’s term. This loan is both fixed and adjustable. It features an introductory period of three-to-ten years. Once that period ends, the loan can reset annually. Depending on the length of the introductory period, the initial adjustment can be up to two percent and the lifetime cap is either five percent or six percent. Hybrid ARM rates can be significantly lower than fixed rates, and a great alternative for anyone who expects to pay off the loan in a few years. These other loans are not commonly offered by most lenders, but the VA does back them. According to the VA, “Most lenders do not make construction loans for VA loans, largely due to risks and costs of construction disputes. You can be your own contractor, but you will have to find your own source for construction financing. Another option is an FHA 203(k) loan, which is fairly common and allows you to purchase and rehabilitate or build a home. This repayment option allows smaller-than-normal monthly payments for the first few years. They gradually increase each year, eventually leveling off after the end of the “graduation period” to larger-than-normal payments for the remaining term of the loan. The reduction in the monthly payment in the early years of the loan is accomplished by deferring part of the interest due on the loan each month and by adding that interest to the principal balance. This is “negative amortization,” and it has a risky reputation. However, the VA says it’s appropriate for applicants whose income will increase substantially. However, these loans do require borrowers to make a down payment to cover the negative amortization upfront. The borrower, home seller, a friend or relative may “buy down “mortgage payments by making a large lump-sum payment at closing. The money supplements the monthly payments for a certain period, usually one to three years, making the loan more affordable. For example, a borrower with a 3-2-1 buydown for a mortgage with a 4.5 percent rate would pay 1.5 percent in Year One (4.5 percent minus 3.0 percent), 2.5 percent in Year Two, 3.5 percent in Year Three, and 4.5 percent for the rest of the mortgage term. This repayment plan provides for a gradual annual increase in the monthly payment. The extra payment goes toward reducing the loan principal, which results in the early payoff of the loan (typically 11 to 16 years). The idea is that as your income (hopefully) increases over time, your forces you to increase your net worth by accelerating your mortgage repayment. The 30-year loan is stable and safe. Your interest rate and payment (principal and interest) won’t change over the life of the loan, and when you sell your property, the buyer may be able to assume your mortgage. However, 30-year mortgages carry the highest rates. The 15-year loan also has an unchanging rate, and that rate is usually about .5 below than comparable 30-year mortgage rate. Because you pay your home off in half the time, your payments are larger. You pay much less interest over the loan’s lifetime. A 1-year ARM offers the lowest initial rate. However, it can increase by one percent every year to a maximum of five percent over your initial rate. It might not hit these caps, but that’s a possibility. The 3/1, 5/1, 7/1 and 10/1 ARMs offer rates that are fixed for three, five, seven or ten years. The initial rates can be much lower than the 30-year mortgage rate, and could save you a lot of money. For example, if you plan to keep a home for five years, you could compare a 30-year loan at 4.25 percent, a 15-year loan at 3.75 percent, and a 5/1 loan at 3.25 percent. Here’s what you need to know about comparing offers from VA lenders. Your quote should contain all the information you need – including the interest rate, lender fees, and money paid to third parties like appraisers and title insurers. A lender may give you a Loan Estimate, which carries a legal obligation to honor the quote, or a worksheet, which does not. To provide a valid quote, lenders need to know your credit score, down payment, and loan type. Without this information, lenders can give you a quote, but it might not be realistic. Try to get your quotes the same day, whether you shop in person, by phone, or online. This is because mortgage rates can change any time, like stock prices or bond yields. Comparing a Monday quote from Lender A with a Friday quote from Lender B won’t tell you much. Narrow your search to two or three lenders with competitive rates. Then contact a loan agent from each. Discuss your loan with these professionals and choose one you like. It’s easy to get and compare VA loan offers from lenders online. You provide your information and requirements, the lenders give you their best deals, and you can evaluate and choose your loan at home with no pressure. VA isn’t just for traditional houses. You can finance a manufactured or mobile home, too. However, it can be harder to find lenders willing to finance manufactured houses. A manufactured home is built on a permanent frame and is made to be moved in one or more sections. It must be built to be lived in year-round by a single family and there must be permanent eating, cooking, sleeping and sanitary facilities. A single-wide manufactured (mobile) home must be at least 10 feet wide and with at least 400 square feet of living space. Double-wide units must be at least 20 feet wide and have at least 700 square feet of floor space. For manufactured homes built on permanent foundations and classified as real estate (you pay real estate taxes on it each year), the loan guidelines are almost identical to those of traditional “stick-built” houses. If your manufactured home is in a park or community, you must own the land it sits on. A modular home is not the same as a manufactured home. Although they are similar – their sections are normally built in a factory and then transported to your lot — the modular home must still be assembled at the building site. You can finance modular homes exactly like you would a stick-built single family house. Refinance your VA manufactured home loan to reduce the interest rate (IRRRL). Manufactured homes designated as real property are financed the same way as traditionally-constructed houses, with the same underwriting guidelines. However, lenders may require a down payment or may only make loans with shorter terms – like 25 years for double-wides and 20 years for single-wides. Veterans, active duty military personnel and eligible surviving spouses may only purchase condominiums that are VA-approved. Before you make an offer for a condo, check the Veterans Information Portal (VIP). If you don’t see the project you want on the VA list, ask your lender if it can get the property approved. (Keep in mind that this process can take weeks, and account for this when you write an offer.) You may also want to see if it’s approved for FHA financing by checking with HUD. In many cases, says the VA, projects approved for FHA or USDA financing can also be approved for VA financing. Ineligible projects include condominium hotels or “condotels”, timeshares, houseboat projects, multi-dwelling unit condominiums, and all projects not deemed to be primarily residential. If your condo project complies with these guidelines, it may be eligible for FHA / VA approval, but the process takes time. Your lender will have to submit a package of documents to either agency, which will review them and make a decision. Note that similar communities like townhomes and planned unit developments (PUDs) may look like condos but do not need special approval for VA financing. Multi-family homes can be sound investments, because you can live in one unit and rent out the others. The income helps offset your mortgage payment. Buying multifamily property is the only way to finance a rental through the VA. You have to live in one unit to be eligible for a VA loan. To meet the occupancy requirement, you’ll have to move into one of the units within 60 days of closing. If all tenants have long-term leases that won’t end within 60 days, you won’t be able to move in unless you can buy one of them out. Most residential loan programs only allow you to finance a maximum of four units – anything more than that is considered commercial property. But lets you buy more, if you do it with other buyers who are also VA-eligible. Property being purchased by two or more eligible veterans, each using his / her eligibility, may consist of four family units and one business unit, plus one additional unit for each veteran participating in the ownership. This means two veterans can buy or build up to six family units (the basic four units plus one unit for each of the two veterans), and one business unit, for a total of seven units. If you want to use rental income from the extra units to qualify for your mortgage, you’ll need to prove that you’re an experiences landlord, and that you have the required reserves. That’s six months of payments, including principal, interest, taxes and insurance. The VA wants to make sure you can pay your mortgage even if the units are vacant for a while. Landlord experience means you must have owned a multi-family home, had previous experience managing rental units, or a history of property maintenance employment or property rental collections experience. Your landlord experience must be documented in writing. You’ll be able to use 75 percent of the verified rent as income. If the units are for unrented units or for property to be built, the VA requires the appraiser to determine the “fair rental value” and a vacancy/operating cost adjustment (usually 25 percent) is applied to that. VA underwriting guidelines list no minimum credit score. There is no minimum down payment. And lenders can use a calculation called the “residual income” to determine if your income is sufficient. That’s usually more generous than the debt-to-income ratios conventional lenders use. VA lenders consider several factors when underwriting your mortgage application. VA guidelines for these items are more flexible than those of most mortgage programs. In its underwriting guide, the VA reminds lenders that, “VA loans involve a veteran’s benefit. Therefore, lenders are encouraged to make VA loans to all qualified veterans who apply.” For most vets, “residual income” is a more generous standard than debt-to-income ratios. Most applicants prove their income by producing pay stubs covering the last 30 days of employment, W-2 forms for the last two years of employment. The lender will also get a written or telephone verification of employment (VOE). Income from a second job isn’t counted unless you have at least 24 months of experience working two jobs. For those with less than 12 months of work history, underwriters also look at the training and/or education and skills that relate to the applicant’s current position. For example, training in nursing or medicine, law, or information technology makes you employable and able to make mortgage payments. Overtime, bonus and part-time earnings that have been received for at least one year can be used to offset term debts with less than 24 months remaining. For example, if you have 14 months left on a car loan and your payment is $300, and you’ve been earning $200 a month in overtime for at least a year, only $100 of your car payment will be counted as debt. Seasonal income may be used under special circumstances. It is important to document the past history and the likelihood it will continue. You can use child support, alimony, or separate maintenance to qualify for your loan if you prove that you’re entitled to it and that you receive it regularly. Usually, that means providing a court order or divorce decree and deposit records. Income from investments can be used as long as you can prove you have the underlying investment and that you receive income reliably. Income from Worker’s Compensation, foster care, public assistance, Social Security, alimony, and child support may be considered if they have been verified as consistently paid and are likely to continue for a minimum of three years from the date of closing. Temporary income such as VA educational allowances and unemployment compensation are not stable and reliable income and won’t be counted. Copies of last two years’ business and / or individual tax returns. The current year-to-date profit & loss statement and balance. A list of the primary partnership owners and their percentage in the business. Taxable Income listed on the bottom of a corporate tax return (IRS Form 1120) may be divided by the veteran’s percentage of ownership and then used as additional income. How is self-employment income calculated? In general, you take the taxable income and add back non-cash deductions like depreciation, plus extraordinary expenses that won’t recur. You’ll subtract windfall income that won’t recur, and average the most recent two years’ income. If your income increased from Year One to Year Two, you’re good to go. If Year Two income is less than Year One income, however, you only get credit for the smaller figure – and maybe even less if your industry is unstable or declining. When at least “a major portion” of your income is from commissions, you have to have received it for at least two years for it to count. The VA does not define “major portion,” but most other programs consider 25 percent the “bright line” for requiring a two-year history. You’ll need your employer to indicate your year-to-date commissions, the basis for computing commissions, and how frequently commissions are paid. Provide your last two years’ income tax returns with W-2s and 1099-MISC Forms. If your income increased from year to year, you get the average of the last two years’ income. If your income dropped, you get the lower year’s income – or less, if your industry is faltering. OR a statement that you intend to reenlist or extend active duty beyond the 12-month period AND a statement from your commanding officer confirming that you’re eligible to reenlist or extend active duty. The VA doesn’t require reserves, which are funds that could be used to pay your mortgage and other obligations if you had an interruption or reduction in your income. However, your liquid assets do count in the overall credit analysis. You don’t need a down payment unless your sales price exceeds the appraised value or the maximum loan amount the lender is willing to make (the VA has a maximum guaranty but does not limit the loan amount). You may not have to pay closing costs, because your lender can cover them if you pick a loan with a slightly higher interest rate. Alternatively, a seller can contribute up to four percent of the appraised value for closing costs. You can wrap refinance closing costs into the loan amount as long as the lender allows it. Your lender will verify any assets that affect its underwriting decision. Your lender can send a Verification of Deposit (VOD) form to every depository institution you use, or you can provide copies of statements (certified by the bank). Your credit report will probably list all or most of your debts. You’ll need to document any debts not listed as well as debts incorrectly listed on the report. For example, child support or alimony can be validated with a copy of your divorce decree. Significant debts are deducted from your income. These are those with a remaining term of at least ten months, or those with less than ten months left but with “very large” payments. In addition, (and VA is the only loan program that requires this), child care expenses are counted as debt payments. When debt payments (including the proposed housing payment) are deducted from income, there must be enough money left (called “residual income”) for you to qualify for your loan. In community property states, your spouse’s debts may be considered, even if he or she is not going to purchase the property with you. If divorced, debts assigned to your spouse won’t be counted as yours by VA lenders. If you’ve co-signed for a loan, the debt won’t be counted as yours as long as you can show that the borrower is making the payments. Once the debts are deducted from your income, you’ll need at least the amounts listed to qualify for your loan. It says, “Lenders should carefully review the complete credit history and use their judgment. For example, if an applicant has numerous unpaid collections – no matter when they were established – it’s not unreasonable to question the borrower’s ability and willingness to honor obligations. However, many lenders add some minimum credit score requirement. Minimum scores of 620 or higher are not uncommon. If your credit score is an issue, ask the lenders that you contact if they have minimum credit scores, and avoid those with requirements you can’t meet. Credit counseling – some lenders treat credit counseling as they would a Chapter 13 bankruptcy, requiring a waiting period after completion before they’ll approve a mortgage. Others view it as a proactive debt solution and a positive thing. The VA agrees, saying, “If a veteran, or veteran and spouse, have good prior credit and are participating in a Consumer Credit Counseling plan, such participation is to be considered a neutral factor, or even a positive factor, in determining creditworthiness. Foreclosure – You may be eligible for VA financing two years after foreclosure. You may have to contact a number of VA-approved lenders before you find one that adheres to VA guidelines without imposing stricter overlays. Ask about them when you get mortgage quotes so you don’t waste time with lenders whose overlays will get your application denied. The one non-negotiable credit issue for VA and other government mortgages is the CAIVRS check. The Credit Alert Interactive Verification Reporting System is a database that lists people who have defaulted on federally-guaranteed debts like student loans, have outstanding tax liens, or other obligations to the federal government. Your lender has to check this database when you apply for a mortgage. If you’re on it, you won’t be allowed to close on a government-backed mortgage until you’ve either cleared up whatever reporting errors or resolved the debt – in many cases, you need to set up a payment plan. When you shop for a mortgage, you get an avalanche of government-required paperwork. Your main focus, however, should be on the Loan Estimate. Make sure your name is spelled correctly, and that the loan purpose, product, and loan type are what you expected. At the top of the first page, there’s a check box that indicates if your interest rate is locked or not, and when your lock expires. Verify that the loan amount is what you want. Note the important loan terms – if it’s fixed or adjustable, and if it has a prepayment penalty or balloon payment. Does the monthly payment jibe with your expectations, and are the monthly taxes, insurance and other assessments accurate? Is the Estimated Cash to Close what you planned for, and do you have the money to follow through? How do the Origination charges compare to those in other offers? Will you be paying points? Compare the Services You Cannot Shop For to those of other offers. Are the homeowners insurance and property taxes accurate? Will you be receiving any lender credits? Is the Cash To Close amount what you thought it would be? Use the Comparisons Section to check the cost of your loan against costs of other offers. It’s easy to do this by subtracting the amount of principal paid from the total paid. Finally, compare the APR for this loan to that of competing offers. At least three days before closing, you’ll get a five-page Closing Disclosure, or CD. You’ll go through the same process that you did with your Loan Estimate, making sure everything is what you thought it would be. The final closing statement match the most recent LE issued to you, and new LEs can be created whenever there is a material change in your loan application. Understand also that the lender is not committed to a given rate and fee structure until you actually lock in your mortgage rate. Compare the costs disclosed in the LE to that of the CD – for items that you can’t shop for, and for lender charges, they have to match. Overcharges to you must be refunded by the lender. When you lock, you get a new LE. You may get one if your property appraises for less than expected, if your credit changes substantially, if your employment status changes or you switch loan products. Any of these events constitutes a material change, and can trigger a new LE. It’s the last LE issued before you close that the lender must honor. It must be added to your purchase agreement and signed by you and your seller. It states that if the property doesn’t appraise for at least the agreed-upon sales price, you are not obligated to go through with the purchase. This says that the federal government has recourse if you default on your VA loan – including (but not limited to), filing a lawsuit, clawing back your retirement benefits and appropriating your tax refunds. It warns that if you sell your home to someone who doesn’t / can’t assume your VA mortgage, the loan becomes immediately due and payable. It discloses that if you assume a VA mortgage, a .50 point funding fee must be paid upfront or will be added to the loan amount. It advises anyone assuming a VA mortgage that they can be charged reasonable processing fees. Buyers who take over a VA mortgage must agree to assume all of the obligations of the veteran under the terms of the instruments creating and securing the loan. When you lock in your interest rate, your lender commits to financing your home at an agreed-upon interest rate and price. Your rate lock is good for a specific time period; then it expires. You don’t have to lock in – this is called “floating” your interest rate – until just before closing. If you float, you may end up with a better rate or a worse rate than your lender originally offered you. Normally, the longer you want your mortgage rate locked, the more it costs to do so. Until you have an actual lock confirmation in writing, you don’t necessarily have a locked loan. Your rate can be locked even if you don’t yet have loan approval, but you do need to have a property address. This means you can’t lock in your mortgage before you start shopping for a home. Mortgage rates move with financial markets and can change several times a day. So, if you want to lock in a specific rate, you may have to do it quickly. If you choose to float, plan on being in contact with your loan officer, so he or she can advise you if market conditions change radically. What if rates drop after you lock? If you want to add certainty to the process, you can pay a fee for a “float down.” This is an interest rate lock that secures today’s rate when you lock in, but you get a lower rate if mortgage rates have improved when you close your loan. For some, especially if they are locking far in advance, this added certainty is worth the extra fee. Some people choose to stop working with their lenders and begin the process over with another one. That can be risky if you’re under contract and obligated to close or have loan approval by a certain date. But if you have the time and are willing to start over, informing your current lender may get you a better deal. What if you don’t close before your rate lock expires? You have a couple of choices – extend the lock (many lenders will give you a couple of extra days for free, while another two weeks can cost .125 percent to .25 percent of your loan amount), relock for another 15 days (also free), or float your rate until you’re ready to close. Unless you’ve paid for a float down, however, all relocks are “worst-case,” which means if rates have remained the same or fallen, you relock at your original rate, but if they’ve risen, you lock at the higher rate. One complication of VA mortgages is the case number that’s assigned to you when you apply for your mortgage. You are allowed only one case number at a time, so if you’ve applied with one lender, it has your case number. If you see that other lenders can offer you a better deal, you’ll need to get your current lender to release your case number before you can lock your loan with a different mortgage lender. There are several reasons NOT to lock in an interest rate. First, if you are refinancing and have a target rate for the deal to make sense, don’t pull the trigger if rates are too high to make refinancing worthwhile. If you really like the challenge of following the markets, and don’t mind gambling, floating your rate could provide a couple of benefits. First, a 30-day interest rate lock typically costs about a quarter point in fees (60 days costs about a half point), which you could save by floating or going with a 7- to 15-day lock. Second, there is always the chance that rates could drop and you could end up ahead. Just determine upfront if you can handle the ride and deal with it if the market doesn’t go your way. the veteran and one or more other veterans (not spouse), all of who will use their entitlement. The lender can choose to accept what amounts to a 12.5 percent guaranty ($50,000 of $400,000) or require a down payment to reduce its risk. Anyone using a VA entitlement must certify that he or she intends to live in the home – you can’t just use your entitlement to help a friend buy a house if you don’t live there. A VA-guaranteed mortgage with non-married co-borrowers must get prior approval from the VA, and the non-VA borrower’s income cannot be used to compensate for inadequate income on the part of the VA borrower. Note that when there are multiple co-buyers using VA entitlement, they can combine their benefits to buy more expensive property. They are also allowed to buy additional units of multi-unit property. This is detailed in the section on multi-unit properties. The VA does not limit the amount you can finance with a VA mortgage. However, it does limit how much it’s willing to guaranty — 25 percent of current VA limit, which is published online each year. In 2019, that’s $484,350 in most locations, but as high as $726,525 in others for a single-family home. And it’s higher for duplexes, triplexes and four-plexes. If a veteran has previously used entitlement that has not been restored, the maximum guaranty amount available to that veteran is reduced. Lenders can use more liberal guidelines, however. If, for example, you buy a $524,100 home in an area with a maximum loan amount of $484,350, you can finance it by putting down 25 percent of the $100,000 difference. $25,000 down for a $524,100 purchase is less than five percent down. VA home loan advantages don’t stop at purchase mortgages. They can be great for refinancing, too. If you’ve already got a VA mortgage, refinancing is really easy – even if your home’s value has decreased, your income has dropped, or your credit rating has crashed. Even if you’d like to add energy-efficient home improvements when you refinance. The mortgage for you is an Interest Rate Reduction Refinancing Loan, or IRRRL. What do you need for a VA-to-VA refinance? First, complete an occupancy certification. You can refinance a second home or rental with an IRRRL as long as it was your primary residence when you got your original VA home loan. Just certify that you occupy or used to occupy the home as your primary residence. If you have a second mortgage, you need to subordinate it to the new loan. Your title company should be able to take care of this for you. energy efficiency improvements are included in the IRRRL. higher interest rate when an ARM is being refinanced. A significant payment increase triggers additional underwriting. If the monthly payment (PITI) increases by 20 percent or more, the lender must certify that your income is enough to qualify you for the new payment. VA mortgage rates are not set by the government, and you can go to almost any licensed lender for your refinance – not just the one you’re with now. The VA even put a warning about this on its website – it says that some mortgage lenders may try to tell you that only they are approved to refinance your loan; that’s not true. In fact, even lenders not approved to do VA loans can approve IRRRLs. Do yourself a favor and get several mortgage quotes and make your best deal. Finally, compare fees. The VA reported that some lenders have told borrowers that certain fees are required by the government. In fact, the only required fee is the funding fee. The elnder can decide to charge additional fees, but they are not required to. As with other mortgage transactions, you may pay third parties for services like escrow and appraisals. You’ll have to buy title insurance, but you’re allowed to shop for a low-cost provider. You may be eligible for a discount on title insurance if you existing mortgage isn’t more than five years old (this is called a “short rate”). You may be offered a better rate if you’re a senior citizen, member of certain professions or groups, or fall into other special classifications. So ask and compare. The VA limits the loan origination fee (or lender fees for origination-related services like processing) to one percent of the loan amount. You don’t have to pay your VA refinance costs out-of-pocket (although you can choose to do so). Instead, you can add them to your loan amount. Your maximum loan amount is calculated by taking your VA loan balance plus allowable fees and charges, including a maximum of two discount points and your funding fee. If you want to finance allowable energy-efficient improvements (up to $6,000), you can include them in your refinance amount as well. Allowable energy improvements must have been completed within 90 days preceding the funding of the loan for you to be reimbursed. You aren’t allowed to take cash out with an IRRRL, but if you’re refinancing a loan that’s 30 days or more past due (which must be submitted for prior approval), you’ll be able to include past due payments, late fees, and reasonable legal costs. What is NOT required to get approved for a VA-to-VA refinance? As long as you are current on your VA mortgage, you aren’t required to have good credit to get your IRRL approved. There is no credit underwriting performed unless your payment will increase by 20 percent or more (if, for example, you were to refinance from a 30-year mortgage to a 15-year home loan). You’ll also have to go through underwriting if you are more than 30 days behind on your current home loan. If you have an active Chapter 13 bankruptcy, your new refinance may have to be approved by the bankruptcy trustee or judge. You won’t need an appraisal. You don’t need to document your income. In fact, you don’t even need a job. You won’t need your certificate of eligibility either. Your lender may use the VA’s automated Prior Loan Validation procedure for an interest-rate-reduction refinance. Refinancing your VA loan is easy because the VA already guarantees your loan. Allowing you to refinance — even if your credit is bad, your mortgage is underwater or you’re unemployed — can only make it easier for you to make your mortgage payments and perhaps reduce your chances of ending up in default. Today, however, it may be smart to refinance to a VA mortgage if you qualify. If you have improved your credit, or your condo has obtained VA approval, or if you can get a better interest rate with VA financing, it’s time to think about making the switch. The VA funding fee is likely to be cheaper than private mortgage insurance if you have less than 20 percent home equity, especially if your credit score isn’t stratospheric. It’s smart to have your loan professional give you both conventional and VA options for comparison. The Veterans’ Benefits Improvement Act of 2008 made it possible for veterans to refinance up to 100 percent of their homes’ value, an increase over the previous limit of 90 percent. One reason for implementing this change was to “allow VA to assist a substantial number of veterans with subprime mortgages to refinance into a safer, more affordable, VA guaranteed loan,” said Secretary of Veterans Affairs Dr. James B. Peake in a 2008 press release. “Veterans in financial distress due to high rate subprime mortgages are potentially the greatest beneficiaries,” he said. How good does your credit have to be? So if you have made all of your account payments on time for a year, you have a fair chance of getting a refinance approved. If you are in a debt management plan, you may be considered for a VA refinance after making 12 consecutive on-time payments to the plan. If two years have passed since discharging a Chapter 7 bankruptcy or a going through foreclosure, those events can be disregarded by VA lenders. This may even be possible after one year if you have successfully reestablished credit and the bankruptcy was caused by circumstances such as unemployment or illness. You can refinance while in a Chapter 13 plan if you have made 12 payments on time and the Trustee approves. You must prove your income for a VA refinance. To count any income, the underwriter must determine that your it is likely to continue. Overtime, bonuses, commissions, and second-job income only count once you have a two-year history of receiving such income. Self-employment income counts once you have been in business for at least two years. Talk to a loan professional. Just because your income was insufficient or unverifiable the last time you applied for a loan doesn’t mean it is now. Due to the recent popularity of FHA financing, many condominium projects have made the effort to get approved with HUD in order to attract more buyers. The VA accepts condos approved by FHA prior to December 7, 2009. After that date, the condo association has to get approved by the VA. You can find VA-approved condos and FHA-approved condos online. Studies show one fifth of those who are eligible for VA mortgages don’t even know the program exists. That may be a communication problem – there is nothing on a standard mortgage application that requests your veteran status. In addition, not all lenders are approved to originate VA loans, so it may not be offered. If you’re thinking about refinancing, check with an approved VA lender when you shop for your home loan. It might be the best choice for your next refinance. VA supplemental loans can only be taken out against homes financed with a VA mortgage. Even if you’re an eligible veteran, if you don’t have a VA mortgage, you can’t get a VA supplemental loan. The home must be owner-occupied by the VA-eligible borrower. If you get a second mortgage to finance home improvements, the mortgage you already have must be current. However, you can also take out a supplemental loan to bring your mortgage current – in that case, you are allowed to be in default or delinquent on your mortgage. If you apply for your supplemental loan with a lender other than the one that has your existing home loan, or if you apply with a lender not approved by the VA to automatically close mortgages, your application will have to be approved by the VA. This could take longer. VA rules also require those alterations to be “restricted primarily to the maintenance, replacement, improvement or acquisition of real property, including fixtures.” Unfortunately for some, the VA says, “Installation of features such as barbecue pits, swimming pools, etc., does not meet this requirement”. Supplemental loans are similar to FHA 203(k) mortgages, but they cost less. They are great for buyers of “fixer-uppers” or distressed sale homes, like foreclosure properties. The supplemental loan can be part of the first mortgage (for example, if you take it out when you purchase your home) or a junior lien (second mortgage). The interest rate for first mortgages is lower than that of second mortgages. So, if you buy a home knowing that you’re going to do some renovating soon, you’ll probably get a better deal by taking the purchase loan and supplemental financing as one loan. Unlike most conventional home equity loans, you can take 30 years to pay off your supplemental loan. This keeps your payment lower. Receive VA compensation for service-connected disabilities. Would be entitled to service-connected disability pay if you did not receive retirement pay. Are rated by VA as eligible to receive compensation for a pre-discharge disability. Are entitled to receive compensation but not presently in receipt because you’re on active duty. Are the surviving spouse of a veterans who died in service or from service-connected disabilities. What’s An Assumable Mortgage Worth? The assumability of VA mortgages is no big deal when mortgage rates are on their way down. However, when rates begin rising, this benefit is prized. If the current market rate for mortgages is six percent, a home that comes with a four percent assumable mortgage is just more valuable than its competition. Supposed that you refinance your home today with a four percent VA mortgage. If you owe $331,685, and you decide to sell your home five years from now, you’ll owe about $300,000. If rates have increased from four percent to six percent, a buyer trying to choose between your home and your neighbor’s (both priced at $360,000) might make this comparison, using a loan calculator. Total paid over life of loan, including down payment and closing costs: $716,515. Total paid over life of loan, including down payment and closing costs: $539,554. This means you may be able to ask a higher price for your home, sell it faster, or both. How Do you Assume A VA Mortgage? The VA (or the loan’s servicer, if it has automatic authority) must approve an assumption before you sell the house. Otherwise, the servicer or the VA could foreclose (although this almost never happens). Then, the seller (you!) would be liable for any claims paid and the costs of foreclosure. The loan must be current, or you must pay past-due amounts at closing. The buyer must be creditworthy and meet VA underwriting guidelines. The buyer must assume all of the mortgage obligations. Maximum allowed by state law. A lender with automatic authority has 30 days to underwrite the application and notify the seller of its decision. Lenders without automatic authority must and submit the application package to the VA within 21 days; the VA may take up to an additional 21 days to underwrite the loan and notify all participants. Upon approval of the sale, the servicer calculates the new loan balance, including the .5 percent funding fee, draws up the paperwork, and the transfer takes place. The seller has tried unsuccessfully to find a qualified buyer. Other special circumstances involve divorces in which one party takes over a VA mortgage and the other is released. In assumptions due to divorce, there is no funding fee charged. Normally, you can use your entitlement to buy a home, sell it at a later date, paying off the VA loan, and restore your entitlement. You can then reuse it for another home purchase. However, when someone assumes your VA mortgage, it isn’t paid off, and your entitlement can’t be restored until it is. Only when VA loans are assumed by buyers with their own entitlement, and they agree to substitute their entitlement for that of the sellers, can an assumption take place without loss of entitlement. The value of assuming your VA refinance or new home loan depends on mortgage rates at the time you sell (which you have no control over), but also on what rate you get when you buy or refinance with VA. So the better your rate today, the more your mortgage assumability is worth tomorrow. Shopping for your VA mortgage online is a free and easy way to compare a lot of interest rate quotes and be confident that you get a great deal. It can really pay off when you sell. Thanks to the Post-911 Veterans Educational Assistance Act of 2008 (also known as the Post-911 GI Bill), veterans who served in the U.S. armed forces after September 11, 2001 can receive the most generous education benefits issued by the government since the first GI Bill was passed in 1944. According to recent data from the U.S. Census Bureau, employees 18 and over with a bachelor’s degree earn an average of $51,206 a year, while those with a high school diploma earn $27,915. Workers with advanced college degrees make an average of $74,602 whereas those without a high school diploma average just $18,734. Because military training and experience doesn’t always translate directly into civilian employment, getting a college education can help you successfully compete for the best jobs and salaries. Unfortunately, nearly half of eligible veterans have yet to take advantage of these well-deserved benefits. A poll by The Washington Post revealed that up to 48 percent of the personnel who served in Iraq, Afghanistan, or both, haven’t even applied. Like the original GI Bill, the new program offers a big leg up when it comes to paying for college or another form of higher education (such as technical school). You can receive either $1,789 a month toward up to eight semesters of schooling, or 36 months of free tuition and fees, at any public college. To finance private college tuition, as much as $21,085 per year is available. And if you’ve served 10 years on active duty, you can transfer any unused benefits to a family member. In addition to tuition and fees, the government will provide you with a monthly housing allowance while you’re in school, as well as up to $1,000 to use for books and supplies. Some veterans may also qualify for a one-time relocation allowance. For students taking all their courses online, a monthly stipend is available, which currently averages $805.50. If you plan to attend a private or out-of-state college, you may also qualify for extra financing through the Yellow Ribbon Program, a partnership between the VA and certain schools that pays some tuition costs not funded by the Post-11 GI Bill. For more information, visit benefits.va.gov and search for Yellow Ribbon. Licensing and National Testing programs. Entrepreneurship training and Tutorial Assistance. To eligible for 100 percent of the educational benefits, you must have logged a total of 36 months of active-duty service, or have been discharged for a service-connected disability following 30 days of continuous service after September 10, 2001. If you served fewer than 36 months, the percentage of benefits ranges from 40 percent to 90 percent. For more details, visit: benefits.va.gov/BENEFITS/factsheets/education/Post-911_General_info.pdf. To date, more than 750,000 veterans have used Post-911 GI Bill benefits to enroll in post-secondary school courses. If you know one or more of these people, you also know that the transition from military camp to academic campus can sometimes be challenging. According to several studies, the most frequently cited challenges for veterans are relating to the non-veteran students, balancing coursework with other responsibilities (e.g., work and family) and coping with service-related disabilities and PTSD. Many student-veterans report that the best way to ease the transition is to seek out other veterans and veterans’ groups on campus for advice and support, and to develop good working relationships with faculty and staff. In some cases, socializing with older students is also a good idea, since some of the challenges mentioned above are common to all students in their twenties or thirties, regardless of whether they served in the armed forces. If you want to take advantage of your Post-911 GI Bill benefits, don’t wait too long. You or your spouse must use the money within 10-15 years of leaving the service (depending on the benefits for which you qualify) or they will expire. For most ex-military personnel, one of the biggest challenges is finding civilian employment, with 69 percent of veterans describing this as a major concern. If you recently separated from the service and don’t yet have a job lined up, there are a number of steps you can take to enhance your short-term finances and improve your odds of landing a good job. To start, find out whether you’re eligible for unemployment benefits through the Unemployment Compensation for Ex-servicemembers (UCX) program. If you were on active duty with a branch of the U.S. military, separated honorably, are currently looking for work, and aren’t receiving other unemployment benefits, you may qualify for weekly payments during your job search. Although UCX is mandated by the federal government, it’s administered by the states, so the amount you receive will depend on the state where you live, based on that state’s unemployment rate, cost of living and other factors. Once you’ve finished active duty, received your DD Form 214 and completed terminal leave, you can apply for benefits by contacting the department of labor in your state. Lack of preparation for finding a civilian job. Unrealistic expectations for the kind of work and salary for which they qualify. Unaddressed mental health issues, including PTSD, which is a leading predictor of veteran unemployment. Evaluate and translate your military skills and experience into civilian terms using the Skills Translator at military.com/veteran-jobs/skills-translator. Then, create a civilian version of your resume that explains your former titles and responsibilities in civilian language. Join veterans’ networks and social media sites such as LinkedIn. Military personnel get a free, one-year premium membership to LinkedIn, which allows you to email members outside your personal network and shows your profile at the top of the list of recruiters’ searches. You can ask about specific employers via LinkedIn’s military network or the military-only social network RallyPoint. Check out industries with a history of hiring veterans, including law enforcement and IT, as well as job search firms that specialize in placing former servicemembers. If you’re still on active duty and have saved up some leave time, use that time for job interviews instead of holding onto it so you can get paid for it after discharge. The best way to shorten the time between your discharge and finding civilian employment is to formulate a clear career plan – if possible, before you even leave the military – and to make sure your resume is solid before sending it out. If you aren’t sure about the quality of the resume, show it to friends, family and colleagues for their opinions and input. According to the RAND Center for Military Health Policy Research 20 percent of the veterans who served in Iraq or Afghanistan suffer from either major depression or PTSD, and 19.5 percent have experienced a traumatic brain injury. Unfortunately, only 50 percent of ex-servicemembers who need mental health services receive treatment because of barriers that include: embarrassment about service-related mental disabilities; long wait times to receive treatment; the perceived stigma associated with mental health issues; and a lack of understanding or awareness about mental health problems and treatment options. If you or someone you know is suffering from a mental health problem, don’t wait to seek help. The VA provides a variety of inpatient and outpatient mental health services for veterans and their families at medical centers and community-based outpatient clinics across the nation. For information about PTSD, as well as self-help resources, visit ptsd.va.gov. If you’re experiencing emotional distress, and want to talk with a trained mental health professional, call the Veterans Crisis Line at 1-800-273-TALK (8255). For more information, including eligibility requirements, visit va.gov/benefits or your nearest VA regional office. If you’re a homeowner with a disability, you may also qualify to have all your local real estate taxes waived, a benefit that could save you thousands of dollars a year. According to a 2016 report, there were 47,725 estimated homeless veterans. The good news is that the number of homeless veterans has fallen by nearly 35% since 2009, and the number of “unsheltered homeless” (those living in the streets, cars, abandoned buildings, etc.) has declined by 57 percent. However, many ex-servicemembers still lack permanent housing and make up eight percent of America’s total homeless population. Another 1.4 million are at risk of homelessness – due to poverty, mental health or substance abuse issues, overcrowding in government housing, and a lack of support networks. Most homeless veterans (96 percent) are single men from poor, disadvantaged communities. Community Resource and Referral Centers (CRRCs): Located in strategically selected areas, these centers offer both a refuge and a central location to engage homeless veterans in services. Veterans using the centers are referred to physical and mental health care resources, job programs, housing options and other benefits. Health Care for Homeless Veterans (HCHV) connects homeless veterans with health care and other needed services. The program provides outreach, case management and HCHV Contract Residential Services to ensure that chronically homeless veterans – especially those with serious mental health and/or substance use problems – can be placed in VA or community-based programs that provide quality housing and other specialized services. Homeless Patient Aligned Care Teams (H-PACTs) provide a coordinated “medical home” tailored to homeless veterans’ needs. At selected VA facilities, veterans are assigned to an H-PACT that includes a primary care provider, nurse, social worker, homeless program staff, and others who offer medical care, case management, housing assistance and social services. The H-PACT provides and coordinates health care while helping veterans to obtain and stay in permanent housing. For more information about these (and the other) VA programs that serve homeless veterans, visit va.gov/homeless. Many Americans struggle to save money, build good credit, and make and manage their investments wisely, but veterans and active-duty personnel face additional financial challenges because of the unique demands placed on them by the military – including overseas deployments and frequent moves. Combined with the complex pay and benefits system and a lack of personal finance education, these factors can leave servicemembers unprepared to smoothly reintegrate into the civilian economy. For example, 55 percent of veterans believe they aren’t adequately prepared for a financial emergency, according to one survey. The #1 obstacle to financial stability is the frequent relocations that are a part of military life. These moves can make it difficult for officers to adjust to different living expenses and for their spouses to hold steady jobs. And when servicemembers must move after buying a house, they may be forced to rent the property (which comes with its own set of challenges) or sell it for a loss. Another obstacle to smart money management is lack of financial education. Although financial literacy is an issue for both civilians and military personnel, servicemembers may not be aware of how much they don’t know until they separate from the military. It’s not uncommon, for example for veterans to earn more money in the civilian world, but find themselves in a worse financial position because they no longer receive the allowances and other benefits they once did. Seek out an objective financial adviser, preferably one who understands military issues such as pay and pensions, and beware of high-commission financial products, such as “special mutual funds,” that are “designed” for servicemembers. Avoid high-interest payday loans like you would the plague. Burnish your credit rating by paying your bills on time, and by ordering copies of your credit score from one of the three credit reporting agencies (equifax.com, transunion.com and experian.com) to correct any mistakes. If you’re deployed overseas, it’s a good idea to request an “Active Duty Alert” on your file to help protect yourself against identity theft. In addition to maintaining your purchasing power, a good credit score may help you land a civilian job, as some employers check these reports during the hiring process. Make a “civilian budget” that takes into account your changed financial circumstances – e.g., the loss of non-taxable military housing and moving allowances, etc. A financial advisor or accountant can help you with this, but to start, you may want to visit the pay calculator at gijobs.com to determine how much you’ll need to earn in a civilian job to match your military take-home pay. Build a financial cushion before leaving the service to smooth your transition to civilian life. It’s a good idea to save and invest enough of your pay to cover six to nine months’ worth of living expenses after you leave the military. If possible, save at least 10 percent of your paycheck, and put it into relatively safe investments such as mutual funds, CDs and high-yield savings accounts. (If you own a home, you could apply for a home equity line of credit (HELOC) so you’ll have a ready source of cash. Finding civilian work often takes longer than veterans expect, but if you’ve saved enough, you’ll have time to be more selective about employment opportunities instead of feeling pressured to accept “any old job” ASAP. If you want to buy a house after leaving the service, apply for a VA mortgage. 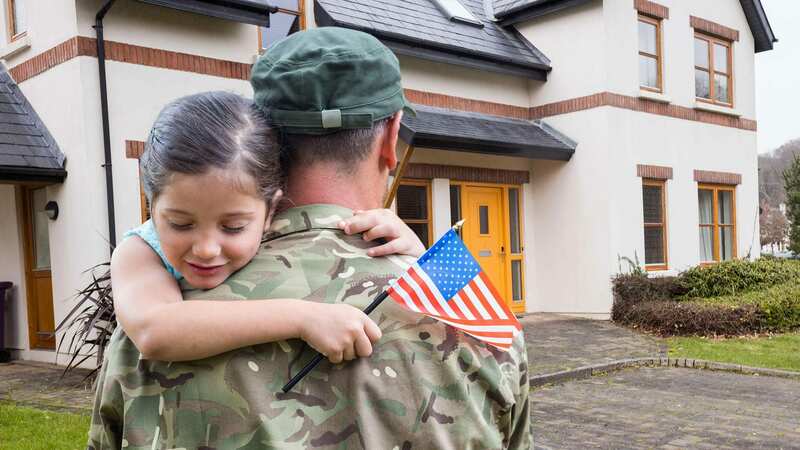 VA-backed mortgages encourage private lenders to offer veterans lower-cost loans with competitive interest rates, low (or no) downpayments and other favorable terms. While you’re still on active duty, however, it usually makes more sense to rent than buy – unless you’re certain that you won’t be relocated for at least five years. For general financial advice, check out the “especially for servicemembers” section at consumerfinance.gov/askcfpb/.